What is the Significance of Our Constitution, and Can Nullification Save It? Thanks to the policies and conduct of President Obama, many people are finally learning what real American values are. In the end, his legacy may very well be that he inspired Americans to take a stand for their constitutional liberties. Yet, I am amazed that certain people still don’t appreciate the immeasurable value of that simple document that spans about six printed pages. Or maybe they don’t want to take the time to educate themselves on the meaning of life, liberty, and pursuit of happiness. Maybe life in the United States for many people isn’t about freedom and opportunity anymore but rather about control, boundaries, and things. Maybe “bread and circuses” satisfy the soul more deeply than the exercise of one’s freedom. If that is true, how sad a statement it makes about the evolution of mankind. What a sad statement it makes about a people who are overwhelmingly blessed with freedom and protection and who have been the lucky benefactors of the actions of generations of brave and honorable men and women who fought and sacrificed for those ideals but too weak and apathetic to pay it back or pay it forward. It sets forth the enumerated, limited responsibilities of each branch of government, leaving the residual bulk of power to the States (10th amendments). All government action beyond the expressly enumerated powers is unconstitutional. It exceeds the grant of power that was agreed to under the compact. The first ten amendments (the Bill of Rights) list those rights which are so fundamental to the concept of individual liberty that the government is forbidden to intrude upon them. It represents our Founders’ intent to treat each person as a sovereign, vested with certain inalienable rights that no government can take away. Individuals willingly transfer some of their rights to their local and state governments for their protection, but they DON’T agree to transfer any such rights or responsibilities to a federal or central government other than those that are clearly and expressly listed in the Constitution. Government roles were always intended to be narrowly-construed so as not to burden the sovereign people or divest them of their God-given rights. Is a shield, to protect each individual against the unlawful acts of the federal government. It is NOT a sword for the government to slice away rights and liberties. It stands for the fundamental proposition that in a free society, and especially in a constitutional republic, people do not require constitutional authority to act and to exercise their rights. Government does. We all know that Virginia, and other states as well, refused to ratify the Constitution until special assurances were given that the federal government would remain constrained and would not burden individual rights. That is why several delegates to the Constitutional Convention refused to sign the document – Virginia’s George Mason and Edmund Randolph, New York’s John Lansing Jr. and Robert Yates, Maryland’s Martin Luther and John Francis Mercer, and Massachusetts’ Elbridge Gerry. One of those assurances was the addition of a Bill of Rights and others were given in The Federalist Papers, written by James Madison and Alexander Hamilton, two of the delegates and drafters of the Constitution. The States, in general, were fearful of a government that would have the tendency to become increasingly centralized and destructive of state sovereignty and ratification wasn’t taken very lightly at all. It took almost two years, generated some heated debate (including a suggestion of secession by Patrick Henry), generated transcripts that we are able to consult today as to the meaning and intent of the Constitution, and caused many to wonder whether they weren’t frustrating the goals they sought to achieve with the American Revolution. The People of the State of South Carolina, in Convention assembled, on the 26th day of April, A.D., 1852, declared that the frequent violations of the Constitution of the United States, by the Federal Government, and its encroachments upon the reserved rights of the States, fully justified this State in then withdrawing from the Federal Union; but in deference to the opinions and wishes of the other slaveholding States, she forbore at that time to exercise this right. Since that time, these encroachments have continued to increase, and further forbearance ceases to be a virtue…. In the year 1765, that portion of the British Empire embracing Great Britain, undertook to make laws for the government of that portion composed of the thirteen American Colonies. A struggle for the right of self-government ensued, which resulted, on the 4th July, 1776, in a Declaration by the Colonies, “that they are, and of right ought to be, FREE AND INDEPENDENT STATES…. Thus were established the two great principles asserted by the Colonies, namely: the right of a State to govern itself; and the right of a people to abolish a Government when it becomes destructive of the ends for which it is instituted…. In 1787, Deputies were appointed by the States to revise the Articles of Confederation, and…these Deputies recommended, for the adoption of the States…the Constitution of the United States. The parties to whom this Constitution was submitted, were the several sovereign States; they were to agree or disagree, and when nine of them agreed, the compact was to take effect among those concurring; and the General Government, as the common agent, was then to be invested with their authority…. By this Constitution, certain duties were imposed upon the several States, and the exercise of certain of their powers were restrained, which necessarily implied their continued existence as sovereign States. But, to remove all doubt, an amendment was added, which declared that the powers not delegated to the United States by the Constitution, nor prohibited by it to the States, are reserved to the States, respectively, or to the people…. We hold that the mode of its [the United States’s] formation subjects it to a…fundamental principle: the law of compact. We maintain that in every compact between two or more parties, the obligation is mutual; that the failure of one of the contracting parties to perform a material part of the agreement, entirely releases the obligation of the other…. We assert, that fourteen of the States have deliberately refused for years past to fulfill their constitutional obligations…. The Declaration of Secession (it’s full title reading “Declaration of the Immediate Causes Which Induce and Justify the Secession of South Carolina From the Federal Union”) acknowledged that the federal government is “a common agent” of the States. This means that from South Carolina’s understanding of the compact, the federal government was intended to work on behalf of the States…. each one fairly and equally. The interpretation of the Supreme Court that the ‘elastic clauses” of the Constitution (‘Commerce’ Clause, the ‘General Welfare’ Clause, and the ‘Necessary & Proper’ Clause), in total disregard to all the writings and assurances provided for our benefit by our Founders, pointedly addressed in the Federalist Papers, explained in the State ratifying conventions, and the wording of Constitution itself, confer additional and greatly expanded, implied powers. Several decisions by the Supreme Court which amount to ‘judicial activism’ rather than strict interpretations of the Constitution. (For too many years, and for too many important cases, Supreme Court justices have willingly ignored the writings of our Founding Fathers in their deliberations to concentrate greater power in the federal government). References to the Federalist Papers in decisions from the high court have only become particularly popular since the beginning of the Rehnquist Court in 1986. Luckily, there has been a substantial increase in the frequency of citations to this authority in the last two decades so maybe the leftward pendulum of the Court is now swinging to the right to somehow… hopefully, bring our government back in line with a more strict reading of the Constitution and help get it off our backs, out of our pockets, and out of our way so we can be productive. So how can we re-establish the proper balance between the People and government, before it’s too late? How can we reign in the centralization and exceeding control of government? The answer, most simply, is nullification – the action of a State to declare when the federal government has stepped outside its constitutional bounds and then declare those actions null and void and therefore unenforceable. Nullification, as a States’ rights principle originally proposed by the Federal Farmer (anti-Federalist paper) and then by Thomas Jefferson, says that the States’, being closest and most responsive to the people, are the sovereigns that are the proper guardians of individual liberty. If a federal law exceeds the power in the Constitution or violates the proper balance of power between the government and the states, then it is up to the States, the parties to the federal compact that is our Constitution, to declare it so and then refuse to enforce it. It would be absurd to wait for the federal government to condemn its own law or policy or department. The Federal Farmer (penned most likely by Richard Henry Lee) subscribed to the compact theory of federalism, of which Thomas Jefferson and James Madison also subscribed. In fact, it can be argued that this is the basis of the Tenth Amendment. The Federal Farmer explains that the nation was formed through a compact agreed upon by all the states, and that the national government is consequently a creation of the states. Both Thomas Jefferson and James Madison wrote separately to propose that the Constitution be based on this principle. Under the Compact Theory of Federalism, the United States is made up of a voluntary union of States that agreed to cede some of their authority in order to join the union, but that the states did not and could not, ultimately, surrender their sovereign rights. Under this theory, states can determine if the federal government has violated its agreements, including the Constitution, and nullify such violations or even withdraw from the Union (ie, states would be the final judges of whether the national government has overstepped the boundaries of the “compact.”). If the states did not have inherent authority, the Federal Farmer reasoned, the Constitution would tear down the sovereign states in favor of a consolidated government, and that this end of the federal system would be destructive of American liberties. Richard Henry Lee was a very important historical figure. He was a delegate to the Continental Congress from Virginia and president of that body in 1774. He later served as President of the United States in the Congress assembled under the Articles of Confederation, and as a US Senator from Virginia (1789–1792) under the new Constitution. It was he who, in 1776, presented the formal request for a Declaration of Independence from Great Britain. So, the concept of nullification was indeed a founding doctrine. In fact, it got significant attention in the very early years of our newly-created government. In 1798, the federal government passed the Alien & Sedition Acts of 1798. The Alien Acts were essentially not enforced so they posed no concern at the time. [Note however that the Alien Enemies Act is still on the books today and authorizes the president to deport aliens whose home countries are at war with the US. The Alien Friends Act authorized the president to deport resident aliens who were considered “dangerous to the peace and safety of the US.’ This particular act expired in 1800]. The Sedition Act, however, posed a serious and grave threat to fundamental liberties. The Act established fines and jail time to persons who write (even personal letters), spoke, uttered, published any false, malicious, or inciting statements against the government, or contributed in any way to them or even caused any such to be made. No writings or utterances were to be made to bring contempt or disrepute upon the President or Congress or its members. John Adams was the president at the time. Thomas Jefferson was the vice president. Jefferson was outraged. What could be done, he thought? Petitions or protests wouldn’t work because they would only subject the protestors to fines and imprisonment under the Sedition Act. He reasoned that a stronger response was needed. The extreme, he fully understood, was secession (which he believed was the absolute right of a people who wanted to abolish a oppressive government; he believed wholeheartedly in the principle and right of self-government). This crisis led Jefferson to propose the concept of interposition and nullification – the duty of states and state governments to stand between the People and the unconstitutional actions of the federal government. He wrote: “The true barriers of our liberty are our State governments.” Jefferson claimed that the Sedition Act was a nullity. Jefferson’s concept of nullification states that since the federal government, either as a whole or by any of its branches, is not and cannot be an impartial arbiter of disputes between it and the States, it must be up to each state’s own judgment to decide when the Constitution has been violated and how that violation is to be addressed (such as by refusing to abide by it). In response to the Sedition Act, Jefferson drafted a series of resolutions. Again Jefferson rose to the occasion to protect individual liberty. His resolutions condemned the Alien & Sedition Acts as gross violations of the Constitution and addressed the proper response by the States. He gave a draft of his resolutions to Wilson Nicholas, a member of the Virginia state legislature, who then passed a copy along to his friend John Breckinridge, a member of the Kentucky state legislature. Jefferson’s resolutions would become the Virginia Resolutions of 1798 and the Kentucky Resolutions of 1798. The concept of nullification was officially introduced as a proper means of limiting the size and scope of government. John Breckinridge, who sponsored the resolutions in the Kentucky legislature, argued that when the federal government passed laws that extend beyond its constitutional powers and bounds, the people at the state level (ie, the State legislatures) ought to make a legislative declaration that such laws are unconstitutional and therefore null and void and thereby protect their citizens from their operation. In other words, it is the States’ duty to protect the People and their rights from an overreach of power by the federal government. It was James Madison who ultimately wrote the Virginia Resolutions and in it he asserted that whenever the federal government exceeds its constitutional limits and begins to oppress the citizens of a state, that state’s legislature is duty bound to ‘interpose’ its power to prevent the federal government from victimizing its people. Because of the wording of the Kentucky Resolutions and the Virginia Resolutions, we use the terms “nullification” and/or “interposition” to refer to state action that makes a determination that a federal law exceeds constitutional bounds and therefore it is not enforceable as against the people. The terms are slightly different but they essentially mean the same thing (with some minor differences). The principle of nullification is essential to the maintenance of our federal republic. According to Jefferson, perhaps our most learned and well-read Founder, the States must stand firm against the federal government when it attempts to enlarge its powers, either by forced or activist constructions of the Constitution or by federal action that is not otherwise authorized by our founding compact. 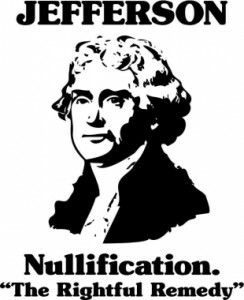 Nullification is well-supported by the compact theory of government (by all accounts, the theory upon which our government was established under the Constitution), by the concept of federalism that provides the greatest “check and balance” on the power of government, and by the very words of the Declaration of Independence which establishes the right of self-governance as a fundamental human right. Nullification was not only a principle, but it was the force behind South Carolina’s attempt to curb the power of the federal government in 1832. This would become known as the Nullification Crisis. History has gone to extensive efforts to erase the doctrine of nullification from the books and from meaningful political discussions. It has gone through extensive efforts to portray South Carolina in a bad light and as an agitator for its part in trying to exert sovereign influence over the conduct of the US Congress and the executive and in understanding this, we can understand why the South was so easily vilified for its decision to secede from the Union. In 1824, a high protective tariff was proposed. The purpose was to protect industry in the North which were being driven out of business by low-priced imported goods (by putting a tax on them). On May 19, 1828, it was passed by the US Congress. It came to be labeled the “Tariff of Abominations” by the Southern states because of the negative effects it had on the Southern economy. The South was harmed directly by having to pay higher prices on goods the region did not produce, and indirectly because reducing the exportation of British goods to the US made it difficult for the British to pay for the cotton they imported from the South. The South responded by lowering the price on their products, cotton in particular. The North took advantage of this and bought the cotton at the lower value for their manufacturing looms. (The South in fact suspected the tariff was put in place for this very purpose – to benefit Northern industry). It also harmed the South by reducing the demand for raw cotton abroad. Because the South was an agricultural society, Southerners relied heavily on sales in the world market for their produce so that the protective tariffs did not offer them any service (only a detriment). All in all, the South suffered most of the losses from the tariff policy and the North reaped most of the gains and the South accused the government of not being concerned with Southern interests. At the time, the South was impoverished and declining in prosperity while the North was becoming wealthy and very prosperous. Historians say that the trend began after the Revolutionary War; they say that the South’s golden era had peaked and was in decline. The South believed they were impoverished to enrich the North. The North, on the other hand, blamed the decline on the South’s inability to modernize and industrialize. The southern states claimed that their economy was suffering because of the intentional conduct of the federal government, which it accused of being pro-North and anti-South. They claimed that the double action on the part of the government of levying revenue from the industry of one section of the Union (the South) and spending it on the industry of another section of the Union (the North) was to blame, we well as the protective tariffs. But despite charges of an impoverished South, its exports, along with the tariffs and customs revenues, were the only important sources of tax revenue that supported the federal government. Some have estimated that 30% of the U.S. population (the South) was providing at least 70% of the income to the government. In that toast was presented the issue that liberty precedes the Union. “Liberty before Union.” Supreme state sovereignty and the right of disunion. In fact, Calhoun wrote an essay entitled, “An Exposition and Protest,” which he published anonymously. The essay argued that since the federal Constitution was a compact between the states, the states had the ability to declare laws unconstitutional. If a state did this, Calhoun argued, then the proper course of action was for the federal government to reconsider the law. Under Calhoun’s plan, a nullified law would have to be re-approved by a two-thirds vote in Congress and a three-fourths vote in the state legislatures, then the nullifying state would have the option of acquiescing or seceding. Andrew Jackson, a Democrat, clearly did not support nullification. After that dinner party and that memorable toast, he kept a watchful eye on his vice president. Going forward, he viewed him with great suspicion. For it was no secret that there was a party in the country intent on subordinating the government to the States and at the time, the greatest voice to that position was in South Carolina. Note that soon after the dinner party, in an attempt to distance itself from the doctrine of nullification, the Virginia state legislature passed resolves intended to wipe from Jefferson’s “fair fame” the “stigma” of nullification that Calhoun was attempting to promote. But nullification continued to become more popular in South Carolina, to the point that the state even began talking about secession. But the state was not yet moved to action. In 1832, Congress passed another tariff which was also protectionist in nature and also harmful to the South’s interests. Although Calhoun was vice president at the time, he could not prevent Andrew Jackson from signing the bill into law. But when the Democratic Party replaced Calhoun with Martin Van Buren as the vice-presidential candidate for the 1832 election (because of the “difference in opinion” between Calhoun and Jackson), Calhoun felt that he had nothing to lose by challenging the law. Calhoun then resigned his position as vice president. The Ordinance of Nullification reached President Jackson on December 1st and on the 10th, he issued a proclamation to the people of South Carolina – The Nullification Proclamation. He warned that they should use their better judgment and denounce the Ordinance. The Proclamation stated that states and municipalities are forbidden from nullifying federal laws. He also threatened to enforce the proclamation with the use of federal arms. Although congressional compromise soon defused the situation, Jackson’s proclamation made it clear that he believed the federal government was the supreme power in the United States and he was willing to use the military to ensure its supremacy. The state of South Carolina felt an escalation of tensions and felt that their position might eventually lead to secession. The states of Virginia, Georgia, and Alabama gave their neighbor assurances that if the government took a stand against her and forced her to secede, they would join her. [North Carolina, “always patriotic at heart, nobly refused to stain her annals with even the semblance of treason and rebellion.”] South Carolina was fully prepared to enforce its Ordinance of Nullification, including a military response. John Calhoun, who had resigned his position as Vice President, assumed Hayne’s seat in the Senate, where he felt he could more effectively defend his state. When President Jackson found out, he resolved to arrest him the minute he stepped foot in Washington, have him tried for treason, and then hung (if found guilty). Representative Webster and others persuaded Jackson to abandon those extreme measures. In order to avert a national crisis (termed the “Nullification Crisis”), leaders in Congress attempted to work out a compromise on the first day of the new session. Representative Gulian Verpalnck of New York proposed a reduced tariff, but it failed to win majority support. Senator Henry Clay then proposed what became known as the “Compromise Tariff.” This tariff would maintain protection, but its rates would decrease every year, until the protective tariff itself was totally eliminated by 1842. The reduction in the tariff over the course of 10 years was designed so that all interests would not be harmed. This proposal was acceptable to a majority in Congress and to South Carolina. When President Jackson was made aware of the Compromise Bill, he exclaimed: “Compromise! I will make no compromise with traitors. I will have no negotiations. I will execute the laws. Calhoun shall be tried for treason and hanged, if he does not instantly cease his rebellious course.” In fact, before he went to bed that night, Jackson let it be known that he intended to act without delay. Representative Letcher of Kentucky was notified (awoken from his sleep) by a Louisiana Senator who had heard directly from a member of Jackson’s staff that Calhoun’s arrest might take place at any hour. Letcher immediately alerted Calhoun to the danger. Not happy with the ‘concession‘ by Congress and wanting the supreme power to crush state rebellion in the bud, President Jackson had a bill introduced from the Judiciary Committee (formally introduced by Rep. Wilkins of Pennsylvania) which would be known as the Force Bill. The Force Bill would give the President the power to use military force to subordinate states and force them to obey all federal laws. The Force Bill met with great opposition in Congress, including arguments that it was unconstitutional. But in the end, both houses passed the Compromise Tariff and the Force Bill, and Jackson signed them both into law on March 2, 1833. Jackson immediately sent US Navy warships to Charleston Harbor. With the passage of the Compromise Bill, South Carolina rescinded its nullification of the tariffs. But it went on record to nullify the Force Bill, perhaps as an act of principle. The crisis was averted. But it wouldn’t last, for Lincoln ran on a platform to raise the tariff to its 1832 rate. Although the crisis was avoided, President Jackson continued to distrust South Carolina and the other southern states. To him, it wasn’t about the preservation of Liberty. He believed their goal was the destruction of the Union and the destruction of the government. He was in favor of a supreme federal government and the southern states were not. He believed the tariff issue was merely a ruse to undermine the government’s supremacy. In fact, he publicly espoused these views. He warned his countrymen that slavery would be the next “pretense” used by the “conspirators” (as he called the southern states) to destroy the nation. After the Nullification Crisis, the South would forever be looked upon with suspicion. They had already been labeled as “conspirators.” They would never be taken seriously again on their legitimate States’ Rights concerns or their fear for the erosion of liberty. In hindsight, the Nullification Crisis would be a rehearsal for the political turmoil that culminated in the American Civil War. It could be argued that nullification worked. South Carolina got the relief it sought (albeit over the course of 10 years). Without its stance, the tariff would have never been lowered. Imagine if all the southern states had banded together to nullify the tariff of 1832. What if all 50 states, or even a majority, decide to nullify the healthcare bill? What if the states decide to nullify a Supreme Court decision, such as Roe v. Wade? Will the federal government send out troops to each state to enforce its law? What reaction will Americans have upon seeing the federal government take up arms against the states for doing what our nation was set up to do – stand up for rights and liberties? The question becomes this: Should the States have an express responsibility to be vigilante regarding the conduct of the federal government and nullify laws, action, and Supreme Court decisions that exceed the scope of the Constitution? Is this the answer to paring back the size of government and preventing the Supreme Court from taking a “living document” approach and engaging in judicial activism rather than strict interpretation? Remember that Jefferson introduced the concept of nullification as a “proper” and logical means of limiting the size and scope of government. Again, states were at least equal sovereigns to the federal government, and not subservient. As we are indeed in a constitutional crisis, shouldn’t nullification once again be introduced as the proper means to limit the size and scope of government? (I would also stress that in addition to nullification, the 17th amendment needs to be repealed….. but now that people have control over their Senators, how willing will they be to give that control up? Only an educated populace can understand the true significance of federalism as a check and balance, the original selection of Senators, and the 17th amendment). How else can we effectively curb the abominations, violations, and excesses of government than to assign an obligation upon the States to be diligent in reviewing the acts of the federal government? The States need to be our first line of defense and then the voting process can be the coup de grace. Again, we just need people to do their homework and research their candidates and elect those to state government who are strong on States’ rights. (1) Compel a person to (i) provide for health care services or medical treatment for that person or (ii) contract with, or enroll in, a public or private health care system or health insurance plan. (2) Interfere with a person’s right to pay directly for lawful health care services or medical treatment to preserve or enhance that person’s life or health. (3) Impose a penalty, tax, fee, or fine on a person for (i) providing for, or failing to provide for, health care services or medical treatment for that person or (ii) contracting with, or enrolling in, or failing to contract with or enroll in, a public or private health care system or health insurance plan. The NC House voted to approve it and the Senate approved it as well, by a strong margin. It reached the desk of the Governor, Beverly Perdue, and she quickly vetoed it. Democrats refused to cross over to the conservative side to over-ride the veto. The Governor and democratic legislators played politics, choosing to provide another service to their constituents rather than stand up to an unconstitutional act of Congress and by the President. My state of North Carolina, once a proud leader and advocate for state sovereignty and individual rights, is nothing more than a puppet of a socialist federal administration. It has no backbone and serves no function to limit the federal government. It is powerless to protect its citizens. It can only “give them things”….. the “things” that are provided by Sugar Daddy, big government. In perhaps the most audacious attempt to enlarge Congress’ power under the Commerce Clause, extending its power from mere objects (goods and services) and instrumentalities of commerce to the forceful compulsion of human beings, North Carolina threw its citizens to the wolves rather than stick up for their right to make healthcare insurance decisions themselves. North Carolina needs a Ken Cuccinelli or a Jan Brewer. For those who want to preserve Liberty – preserve fully the rights guaranteed by the Declaration of Independence and protected in the US Constitution – you must realize what our Founders understood: “Only the States can defend Liberty.” It is therefore absolutely essential that people focus their attention on electing state legislators, governors, judges, and sheriffs who will fearlessly defend their God-given liberties. Thomas E. Woods, Jr., Nullification, 2010, Regnery Publishing, Washington DC. 1 Response to What is the Significance of Our Constitution, and Can Nullification Save It? The 16th and 17th Amendments were the biggest mistakes.